There are the acupressure points for relieving Sinus and Hay Fever. Working on these points can help you get better quicker. You do not have to use all of these points. Using just one or two of them whenever you have a free hand can be effective. 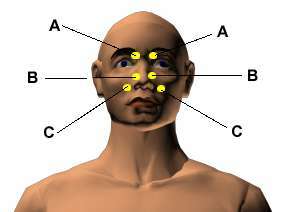 Location: In the indentation of the inner eye socket where the bridge of the nose meets the ridge of the eyebrows. Benefits: Relieves sinus pain, headaches, blurry vision, red and watery eyes, hay fever, and eyestrain. Location: Just to the side of the nostril. Benefits: Relieves sinus pain, nasal congestion, facial paralysis, and facial swelling. Location: At the bottom of the cheekbone, directly below the pupil. Benefits: Relieves stuffy nose, head congestion, burning eyes, toothaches, and eye fatigue. 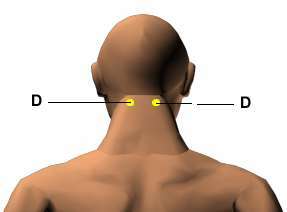 Location: One-half inch below the base of the skull on the ropy muscles one-half inch outward from the spine. Benefits: Relieves head congestion, hay fever, stress, burnout, stiff necks, swollen eyes, and sore throats. Location: On the crown of the head between the cranial bones. To find the point, follow the line up from the back of the ears to the top of the head. Benefits: Relieves sinus congestion, poor concentration and memory, and headaches. 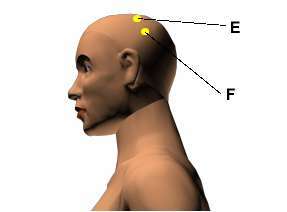 Location: On the top of the skull, in a line upward from the back of the ears, one thumb width from the center. Benefits: Relieves headaches, stuffy nose, sinus and head congestion, and a weak sense of smell. Caution: This point is forbidden for pregnant women because its stimulation can cause premature contractions in the uterus. 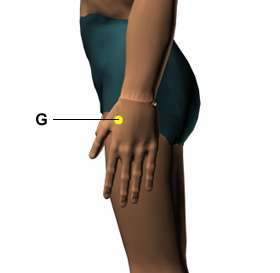 Location: In the webbing between the thumb and index finger, at the highest spot of the muscle when you bring the thumb and index finger close together. Benefits: Relieves headaches, sinus pain, and hay fever, as well as head congestion. 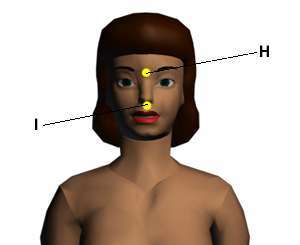 Location: Directly between the eyebrows, m the indentation where the bridge of the nose meets the forehead. Benefits: Relieves hay fever, sinus congestion, headaches, and eyestrain. Location: Two-thirds of the way up from the upper lip to the nose. Benefits: Relieves hay fever, sneezing, fainting, and dizziness.